I've never been one to get Christmas shopping done early, but I make my list in like September/October!! Well, actually I keep a running list year-round. It's just so hard to remember what you actually need when you try to write on last minute. Good luck with your shopping! Everything is so cute!!! I love that brush set its so cute. These are all great options! I'm with you girl, I try to get my shopping done early!! I just started my holiday shopping! I love those earrings! I've already started brainstorming Christmas gifts too! I'm a very bad gift giver and get pretty stressed. Love the idea of makeup brushes! Such a good gift! Oh my gosh, I haven't even thought of Christmas shopping! I do love that state necklace and the makeup bag, so cute! For gifts on a budget, I also love giving friends yummy cookies or treats! Yes girl, I am right there with you! I try to pick up Christmas gifts throughout the year-sales or just whenever I see a gift that really, truly reminds me of someone that I love. It's easier on the wallet too! Love the makeup brush set and the cute tassel earrings. I always shop throughout the year, it's so much easier! 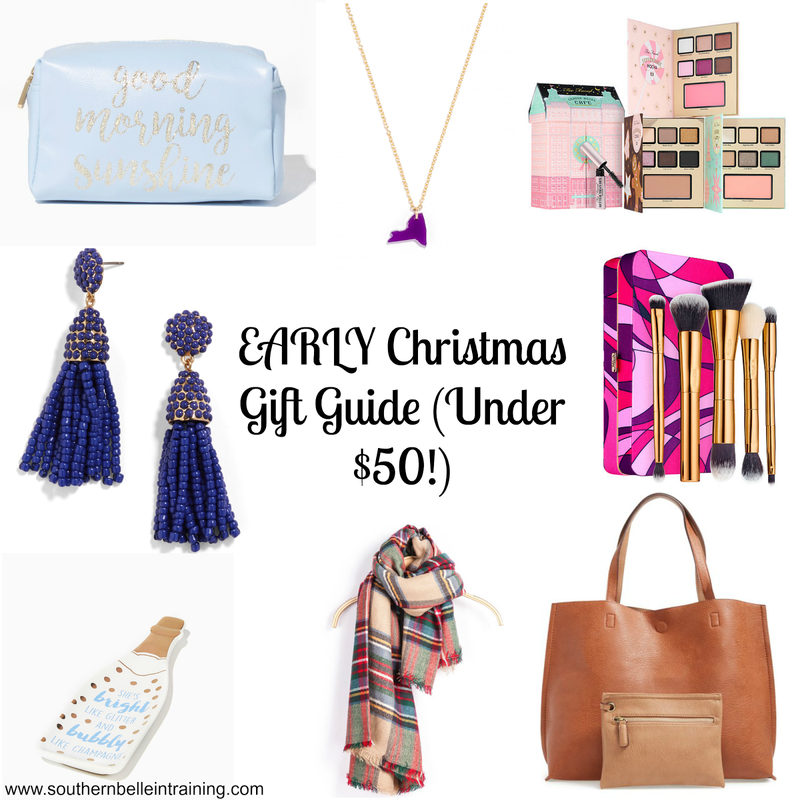 I actually sat for a half hour and contemplated posting an early gift guide yesterday and decided against it. However, you've inspired me to do a post over the next few days! I seriously love the "Good morning sunshine" makeup bag. I really need another makeup bag like I need a hole in the head, BUT IT'S SO CUTE! I always say I'm going to get my holiday shopping done early but it's so hard! I love looking at gift guides though, it's so fun to see reccomendations! Ooh I love your picks!! I just bought that Tarte brush set for myself because I couldn't resist! You are on it girl! I definitely need to start thinking about gifts. I love that scarf. I will gladly accept any of the following as my Christmas present! :) Miss you, beautiful! Is it too soon to go back to Charleston? I have started Christmas shopping and determined to get it done early this year! I create my own list of the best Christmas gifts for girlfriends http://www.christmasgiftstop.com/best-christmas-gifts-for-a-girlfriend/ I think this is the best things to make them more happier. Try to and I'm sure you'll find there some great gifts. Good luck.